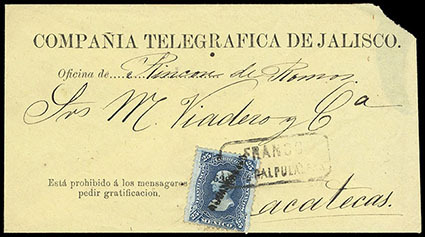 Latin America, Telegram Balance, of 10 scarce covers, some mint and proofs; includes 1880's Mexico "Compania Telegrafica De Jalisco" telegram, Guatemala, 1897-1919 Telegraph issues with proofs and mint, couple Ecuador, 1892-94 Telegraph usages, Argentina "'Vía Jerezana', Cablegrama Inmediato" telegram, and Uruguay "The Eastern Telegraph Company Limited" telegram to Lisbon; very scarce material. Latin America, Collection, to 1960s; mint and used collection in a Minkus Global album, fairly well-filled with pockets of better material in Argentina, Bolivia, Brazil, Chile, Colombia, Costa Rica, early Cuba, Dominican Republic, Ecuador, Paraguay and some Canal Zone etc., useful collection. Latin America, Collection, various country collection housed in seven albums; good completion in many including Uruguay with complete Dilgencia issues and strong completion in later, similar Ecuador with first issue present, Peru with early classics mostly complete plus additional and much later completion, Chile with a nice selection of 1853-65 Columbus issues and later parallel */o, Argentina well formed with a few early issues, and Venezuela with 1859-65 issue complete as well as good later completion; condition a bit varied mostly confined to early issues, an excellent foundation for continuation. Latin America, Postal History Group, of over 100 covers, cards and postal stationery, about half Mexico, including 1839 San Luis Potosi stampless and other 19th Century folded letters and covers, good postal stationery, plus Mexican Revolution and Civil War items, picture postcards, Sonora issues on cover etc., also various Latin America items including an Easter Island card, careful inspection recommended. Latin America, Wrapper Usages, 100+ items, mostly Argentina with some Brazil, Mexico, etc. ; inspect. Latin America, American Express Co. Correspondence Covers, 1930-40's, more than 240 covers from Argentina, Brazil, Chile, Colombia, Ecuador, Guatemala, Panama, Peru, Venezuela, etc., all sent to the main office of American Express Company in San Francisco. Latin America, Postal Cards & Stationery Accumulation, old-time 19th and 20th Century mint and used accumulation of hundreds with many countries represented, some Brazil 1940s view cards noted, worth inspection, generally fine to very fine. Liberia, Picture Post Card Group, of approximately 55 cards, mostly unused with early vignettes and later real-photo, couple used with frankings. Liberia, Post Card Usages, 26 cards all with different frankings, some with German seapost cancels, etc. ; inspect. Liberia, Balance Group, of 12 better items; includes $1 Ordinary (Sc. 79, cat $325), 1909, 25¢ Circular House, Engraver Die Proof, a run of 8 scarcer 1936 issue inverted and doubled surcharge errors, and two airmail covers including a crash cover.